Bad News developers James Ryan, Adam Summerville, and Ben Samuel accepted the Audience Choice Award at the 2016 IndieCade Festival. Two games developed by UC Santa Cruz students won awards at the 2016 IndieCade International Festival of Independent Games, which celebrates the best independent games of the year. The winning games were Bad News, which won the Audience Choice Award, and Threadsteading, which won the Technology Award. "There are only nine awards given out to games, so this is an amazing percentage," said Noah Wardrip-Fruin, professor of computational media at UC Santa Cruz. Graduate student April Grow was a core member of the team that developed Threadsteading at Disney Research in Pittsburgh, where she was an intern. UCSC alumna Gillian Smith was also on the team, and Grow and Smith both represented the game at IndieCade. Threadsteading is a two-player game played entirely on a modified quilting machine, and each round of the game results in a permanent physical artifact: a quilt. 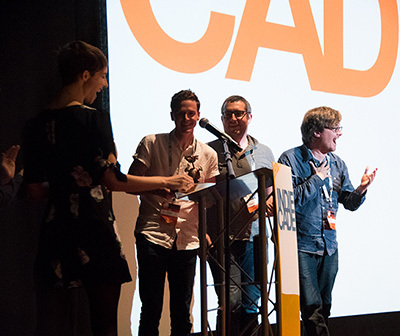 The winning games were among four UCSC games that were official nominees for IndieCade awards.